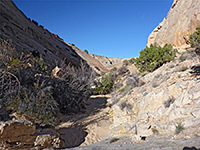 Dozens of ravines cut through the steep east face of the Waterpocket Fold in Capitol Reef National Park, south of Hwy 24, and many form narrow slot canyons, usually where the drainage is enclosed by the Navajo sandstone layer. Those further north, where the reef is wider, tend to be quite long, further apart and sometimes difficult to follow, while to the south as the reef constricts, the drainages are closer together, shorter and so quicker to explore. 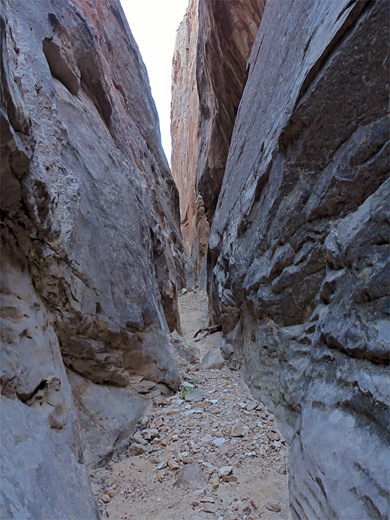 All are reached by Notom-Bullfrog Road, which for the first 20 miles passes the larger drainages, followed by a ten mile stretch with no significant canyons; the shorter ravines begin after about 30 miles, south of the junction with the Burr Trail. One of the few with an official name is Headquarters Canyon, which is the closest drainage to The Post, once an important meeting point for ranchers, and situated where the road bends east, away from the reef and the confines of the valley of Halls Creek, into more open country. 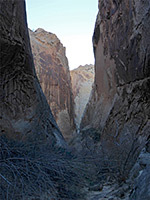 Headquarters Canyon is signed from the road, from where a well-defined trail crosses the flats beneath the reef for half a mile to the wash emerging from the canyon, which has two forks, close together; North (or Main) and South, both containing short slots. 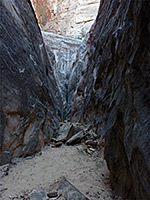 The Navajo sandstone hereabouts is generally dark and dull in appearance, and the canyons do not receive much sunlight, so the passages are rather gloomy. The two branches can be explored in less than two hours. Map of Capitol Reef National Park. The trailhead near The Post is 35 miles south along Notom-Bullfrog Road, the last 25 miles of which are unpaved. A little pull-out area to the east has space for only three vehicles, and high verges generally prevent parking alongside the road, though the remote location ensures there is rarely more than one party here at the same time. This location is 38 miles from Boulder along the Burr Trail and 28 miles from Hwy 276 near Bullfrog Marina, and hence at least an hour's drive from the nearest major highway. Camping at the trailhead ought to be possible, or at the more level parking area for Surprise Canyon, half a mile north, or at a corral half a mile south along a little side road, this the start point for long hikes to the Halls Creek narrows. 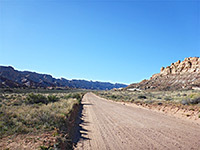 Halls Creek valley is bordered to the east by stark, grey/brown cliffs of Mancos shale at the edge of Swap Mesa, and to the west by the red and white formations of Capitol Reef. 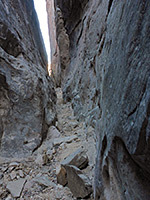 The narrow but easy to follow path leads southwest across dusty flats with sagebrush and tumbleweed, over the steep-sided drainage of Halls Creek (usually dry), up to a low ridge beside a red rock outcrop, then down the far side to a sandy wash, at the edge of the reef. 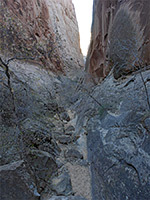 The wash emerges from the main fork of Headquarters Canyon, 900 feet north; the other fork is a similar distance south, after turning right (west), at the first junction. Both routes are cairned. The sandy wash rounds a bend whilst heading generally northwest, through red and purple mounds of the Carmel Formation, then turns sharply southeast at the mouth of the canyon, where the rocks change to white Navajo sandstone. Steep slopes rise on both sides; those to the north are crossed by wide reddish bands. 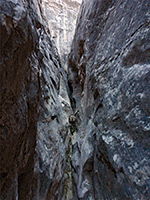 The cliffs come together after 600 feet to form a good, deep slot, only about 300 feet long but very narrow, and free of obstructions. 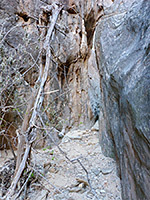 The ravine then widens to a box canyon containing trees and boulders - there are no more slot sections but the drainage can be followed for nearly another mile, until it gains height via an inclined slope and several dryfalls. 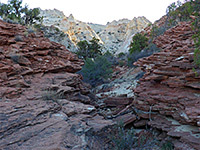 The entrance to the south fork of Headquarters Canyon is reached by following the wash downstream then turning right up the first tributary, which like the north fork passes through a brief band of ledgy, red sandstone (from the Carmel Formation) then enters the Navajo layer. Wildflowers are plentiful along the wash and the open part of the canyons, including parsley and several species of milkvetch. The south fork takes a little longer to form a slot, about half a mile, but otherwise is similar, just not quite as narrow. Several pools may be present at the entrance but there are no significant obstacles. Beyond the slot is a wider section with trees, debris and big boulders, some recently fallen. 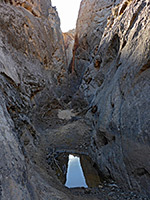 The drainage gradually steepens then levels again and forms a second short slot, which ends at a high dryfall that curves out-of-sight above, framed much taller, vertical cliffs.